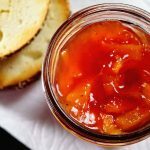 Bright and flavorful peach jam - a way to celebrate summer all year long! Take each peach and with a sharp knife cut an X into the bottom of the peach at the tip. Place the peaches in boiling water for about 1 minute. Remove from the water and immediately plunge the peaches into an ice bath to stop the cooking. Then carefully remove the peel, pit and chop the peaches finely. Measure out exactly 5 cups. In a heavy stock pot, place the chopped peaches, lemon juice, ginger, curry, salt, fruit fresh (if using) and butter. Mix everything together well. Measure ¼ cup of sugar and mix it with the contents of the Sure-Jell. Sprinkle it into the peaches, mix well again and set it on the stove on high and bring to a boil, stirring constantly. Makes 4-5 eight oz. jars. This makes 4-5 pint jars of jam.